JD Cordell believes in honor and hard work. The son of a U.S. vet and his Vietnamese wife, the Navy SEAL is proud to serve his country as a K9 handler with his dog Ajax. But when his team uncovers a deadly terrorist plot in Afghanistan, he never expected the cover-up would reach as high Washington itself. As JD and the SEALS dig deeper, he reveals a mastermind hell bent on detonating a nuke on U.S. soil. When an assassin working for the mission strikes close to home, JD’s fight to save America gets personal. Can JD protect everything he stands for, or will sadistic rebels turn America into a nuclear wasteland? 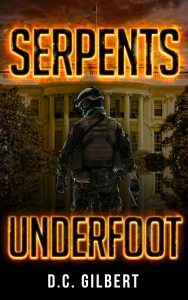 Serpents Underfoot is the first novel in a nail-biting military thriller series. If you like patriotic heroes, fanatical conspiracies, and action-packed adventure, then you’ll love D.C. Gilbert’s tale of SEAL suspense. Buy Serpents Underfoot to fight for America today!